The theme at "Less is More" this week is Technology. I'm not quite sure where the idea for this challenge came from but I was at a bit of a loss as to what to do for it. After a little head scratching I decided to try to make a mobile phone image from some bits of card. I started by cutting a couple of rectangles from black and dull silver card, rounding the corners with graduated sized Corner Chompers...3/8" for the silver and 1/4" for the black. Next I cut a rectangle with a Spellbinder rectangle die, shortening it slightly to fit in the space. For the button I used a flower centre die and a hole punch, fitting the smaller black circle onto the silver piece. The microphone at the top was made with the letter i from a Cuttlebug's Babyface alphabet. The message is also from little alpha die-cuts and the sentiment is computer generated! I had to choose not to add my watermark to this picture as it completely obliterated the sentiment! 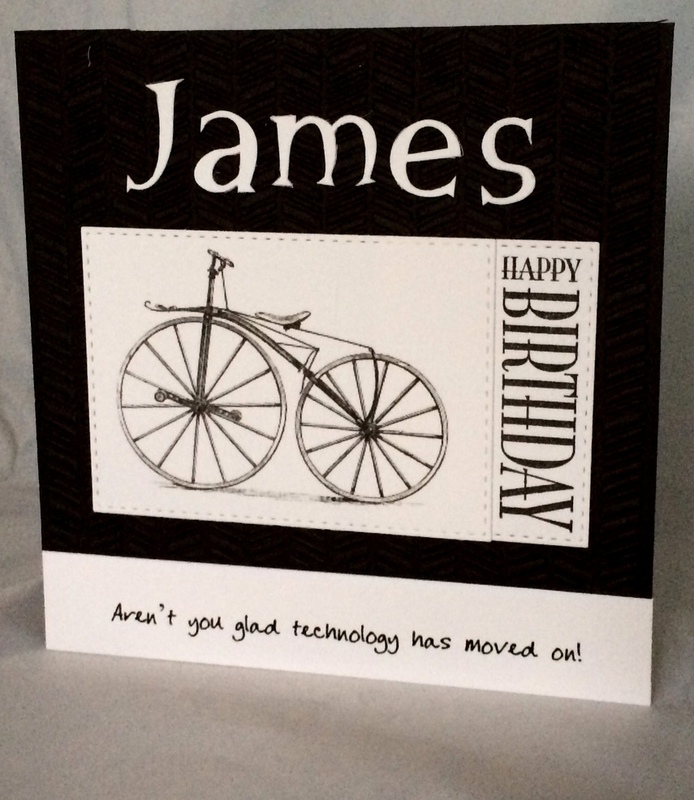 For many years I have made a card for the son of a friend of mine whose passion is bicycles. This is the latest edition! 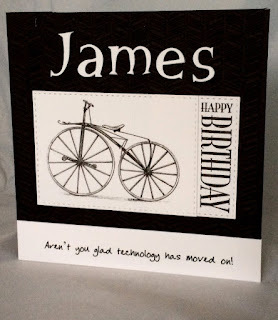 Cuttlebug letter dies, Hobby Art 'Happy Birthday' and computer generated sentiment. The image is an internet download. This coming week I shall be in Bath, looking after my grandson during his final week of part-time schooling ... his life will never be quite the same again! 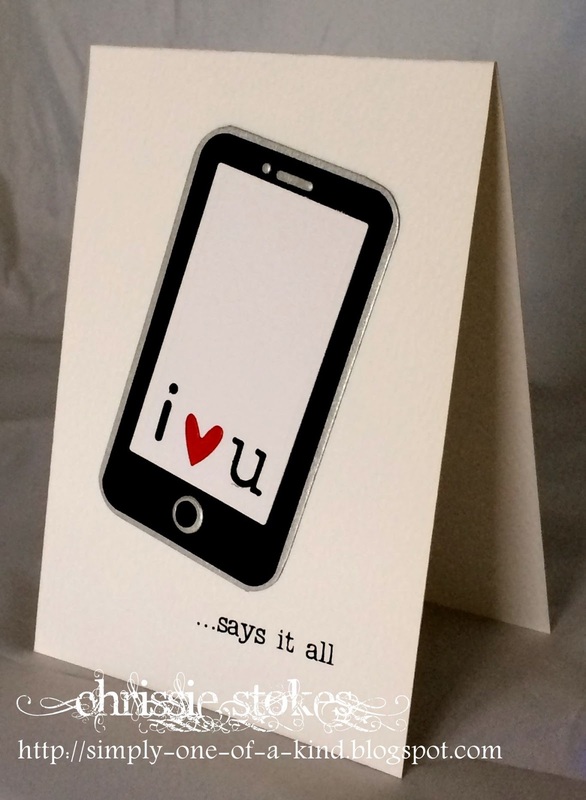 Hi ChrissieJust stopping by to say how much I like your mobile phone card!How very clever-and the result is fantastic! Very ingenious mobile phone card and yes it as it all.! Two clever cards and a perfect sentiment for the second one. Two great cards...REALLY love that first one! I must say this is one of the toughest challenges we've had EVER! I could think of lots of things about technology...but how on earth to morph than into a card! Well done! You guys have provided stunning cards for the theme. Love the cell phone. But it's the card for James that I think is brilliant - that sentiment is perfect! Oops I think I had the not-s0-clever idea for this theme - sorry!! Awesome inspiration... thanks so much! Great cards! After seeing yours I just kept thinking one way for the LIM card...wanted to show that all the technology can lead to things not wanted... Have a fun and colourfull week!